starring my beautiful Ella Jai . I used a base of Bazzill brown cardstock , stamped with black ink using a Prima stamp . Next I Added to the background by randomly placing the Crafters workshop mask on the page, and inking with Grape Versa color. 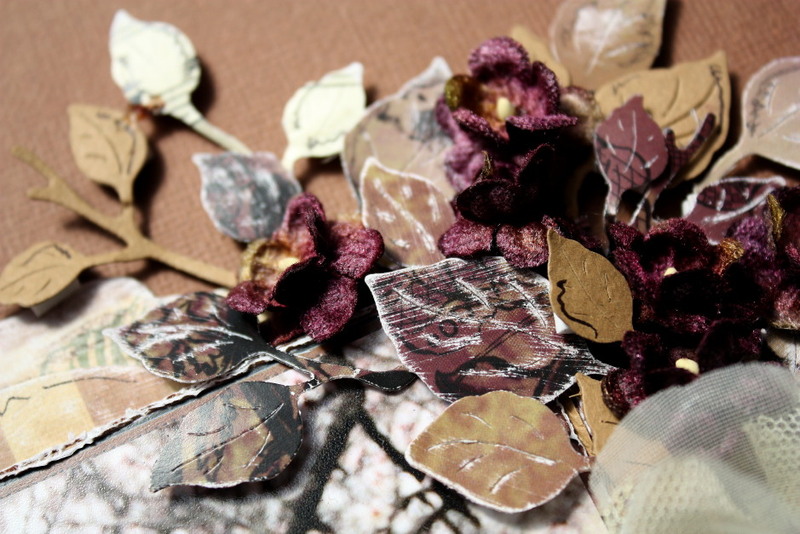 This paper offers such rich velvety colors which match perfectly with the deep velvet antique flowers. I mounted the photo in layers with the Christmas papers and I clustered the rich velvet flowers, die cut leaves and the stunning organza flower around my photo . 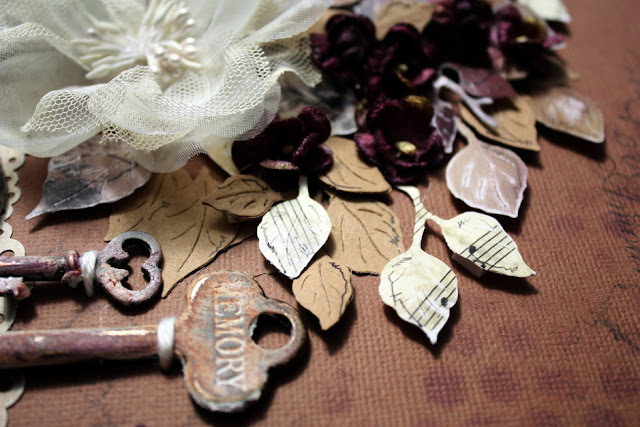 The keys are altered with Gesso and ink and stitched to the page . I distressed the papers by rubbing lightly with an emery board . These papers take on a different feel and look with a light distressing , it brings out the design and amplifies the border punch pattern . Denise has designed these beautiful papers with such amazing diversity . The leaves are all from the one design and yet they look so individual in a cluster , all blending together . All the different tones and hues add to the magic . 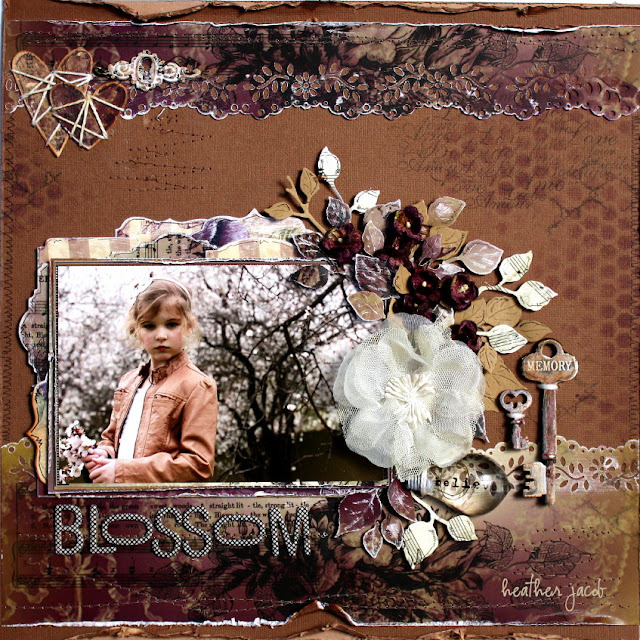 Bazzill card, Gesso, Die cuts/ cottage cuts /foliage. Tim Holtz die cuts/ hearts, Cotton, Prima / light globe/acrylic trellis stamp . Thanks for popping by and have a look on the website at these delightful papers , they are just divine to work with . May Christmas bring you lots of joy and good health ..
Oh wow - this is amazing, Heather!!!!! Love your title work... love it all! Oh goodness this is so beautiful. rich chocolatey and luscious!! love those die cut leaves, gorgeous photo.. really beautiful Heather!! Stunning!!! Gorgeous photo and love the colors! Wow, such an amazing lay-out! Your monochromatic colour scheme is truly gorgeous. Wowwwwwwwwwww!!! This is GORGEOUS!!!! I loveeeeeeeeeee the colors, the layers, the flowers and those keys!!! Absolutely gorgeous!! Love the warm, rich colors! The details are amazing! Wow! What a stunning page! Gorgeous in every way! Stunning page cool colors and yep details..lol! Wow, Ella Jay is starting to look so grown up!!! A real little teenager almost. Lovely colours and your details are gorgeous like always! Wow! You can work neutral palettes like nobodies business. I love it! another incredible work, it's fantastic! Fun to use 'heavy metal' on a romantic layout!! Such a beautiful project Heather. What you are able to do with brown shades is simply amazing. Absolutely love it when you play in this palette. These colours are just stunning. Wow. Beautiful. Ella Jai is so so beautiful. I love the expression on her face. You have showcased her perfectly. Your work is never just ordinary, l am constantly in complete admiration. This is so very gorgeous and stunning! I love the colouring! Love the photo and all the pretty little details! I love the richness you have created with this layout! Beautiful ! Love the stamping, inking, masking background techniques !